Vegetarians and pasta lovers will all love this quick and easy; delicious, healthy dish! Cut the squash in half, with a sharp knife on a level surface. (These are very hard, so make sure your knife is sharp, and be careful when cutting.) Scoop out the pulp and remove all of the seeds. Drizzle 1 Tablespoon olive oil over both halves. Place in a casserole dish and add 1/2 cup water to the bottom. Cook in the microwave for 12 minutes. Using a dish towel or oven mitt, squeeze the middles to see if the squash feels done. (It will feel tender). 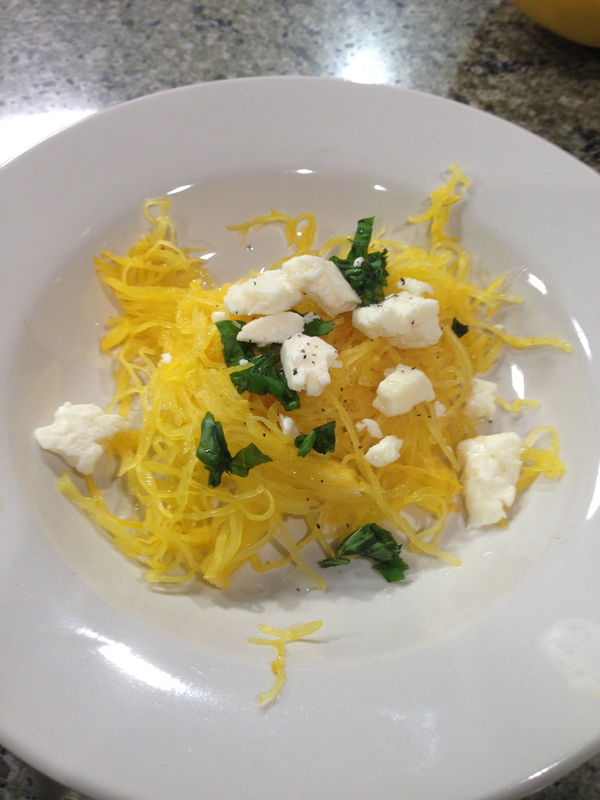 Using a fork, scrape the spaghetti squash into a dish; it will look like noodles as you scrape it. Drizzle a bit more olive oil (about 1 teaspoon) over the squash, then add 1/2 teaspoon kosher salt, 1 teaspoon black pepper reduced fat feta cheese and 2 Tablespoon chopped, fresh basil to the top. If desired, add cherry tomatoes that you have quartered, or cut in half along with any other vegetables of your choice. Enjoy!